Motorola has recently made its way to one of the top Android smartphone manufacturers. To cater all of its phones, the company provides an all-in-one solution, Motorola Device Manager, which houses USB drivers. These USB drivers will help your computer in correctly recognizing which Motorola smartphone is connected to it. The software not only provides these drivers but also helps in updating your device to the latest available firmware. You can read below to find download links for Motorola Device Manager. Whether it is a Windows PC or Mac OS, both are supported with this software. As mentioned earlier, the Device Manage will automatically search through servers to find the latest update available for your phone and will also help in applying it. This means, you wont be needing a third-party solution. You can install Motorola Device Manager directly on your Mac or Windows system. No need of running virtual machines or other unnecessary software just to run Motorola Device Manager. Both iterations of the software carry the same features. Once you connect your Motorola phone after installing the Device Manager, the software package will automatically detect the model number and against that number it will check with its database for any new updates. After getting an update, it will then proceed to install it also. 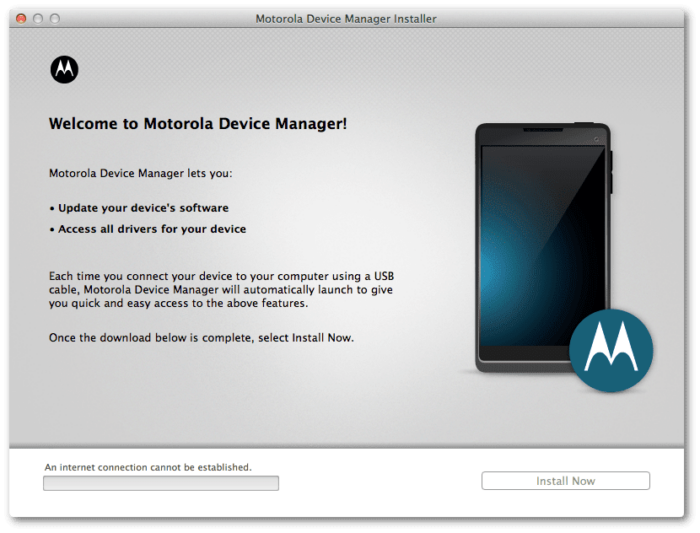 Motorola Device Manager comes with proprietary Motorola USB drivers. Not for few device but all Android running smartphones. This means you can install Motorola Device Manager and then proceed to running third-party software, which will then be able to use correct USB drivers. Motorola Device Manager – 2.5.4 — Latest! Motorola Device Manager 2.2.9 — Latest! Motorola USB Drivers: The whole package comes with latest USB drivers which means you don’t need to install separate USB drivers. Custom ROMs: Installing custom ROMs is not an official procedure hence you can’t perform installation through the Device Manager. For AOSP based ROMs, please visit our Custom ROMs section.